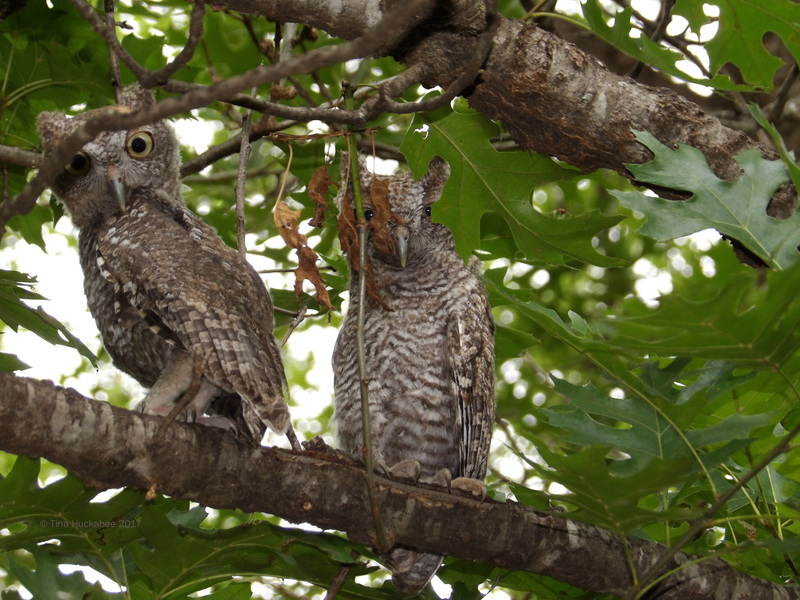 No Eastern Screech Owl, Megascops asio, pair took up residence in our owl house this spring, owing to the tardy eviction of a young Virginia opossum, Didelphis virginianus which you can read about here. We dissuaded her owl box residency, but likely too late for the courting owl couple who’d visited our garden during January evenings. Observing the lovers, I was hopeful for a ninth year of Screech owl doings, even witnessing the female checking out the box early one evening, but alas, I suspect that by then she was considering our box as her backup and not the main nursery. During these past few months, I’ve occasionally seen an adult owl swoop through the back garden just after sundown, which means that they were probably somewhere nearby. I’ve had to glean my owl fixation through other sources like the local folks who placed cameras in their owl boxes and generously shared antics of their owls on Facebook during the nesting and fledging, as well as responding to a frantic phone call from neighbors who were attempting to remove two fledgling owlets from the middle of a busy nearby residential street and who requested my help. 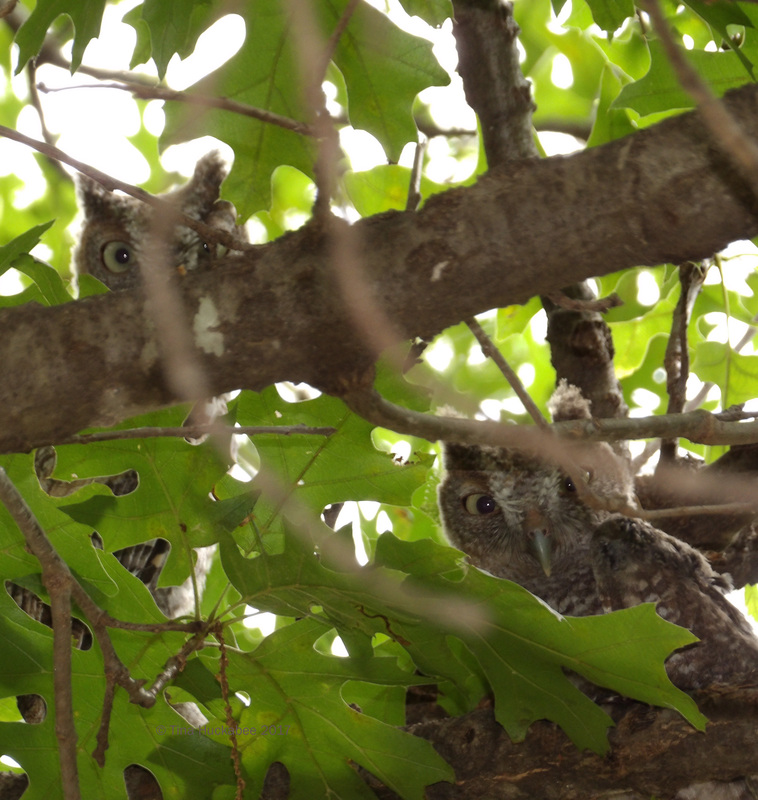 The owlets were rescued, placed safely in shrubs while owl parents were present in the trees, supervising inept humans fumbling with cell phone lights and quibbles about where to place the little raptors. Rest assured that it all ended well: no one (person or owlet) was squished by a car. My Texas red oak tree, Quercus buckleyi, where the owl house is situated, is fully leafed out for the year. Lovely and lush, the foliage provides energy for the tree, shade for the gardener, as well as sanctuary and sustenance for many critters. Note the black line underneath the nest box, heading away from the tree trunk. That’s the cord to the owl cam, which sadly showed no activity in our box, except for industrious ants. 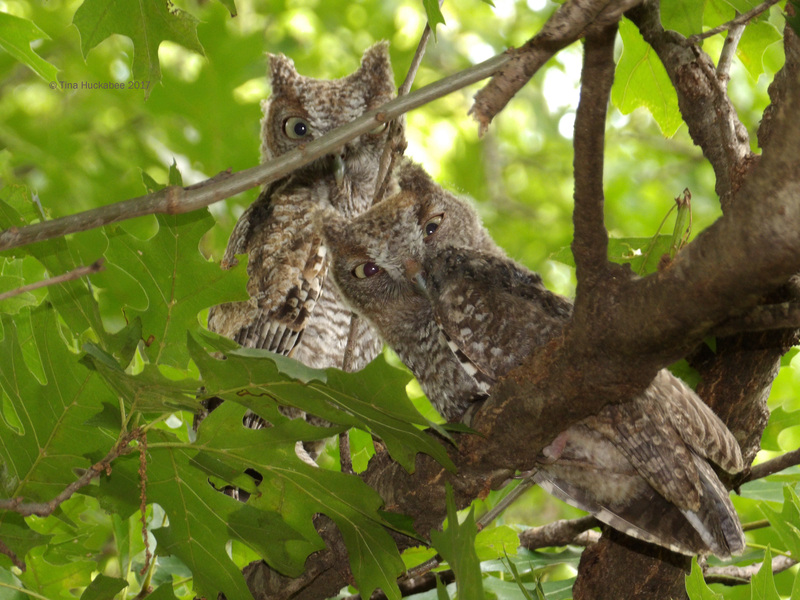 Recently, the foliage has stepped up, or rather, layered over, and is acting as cover for a mama Eastern screech owl and her two fledglings. 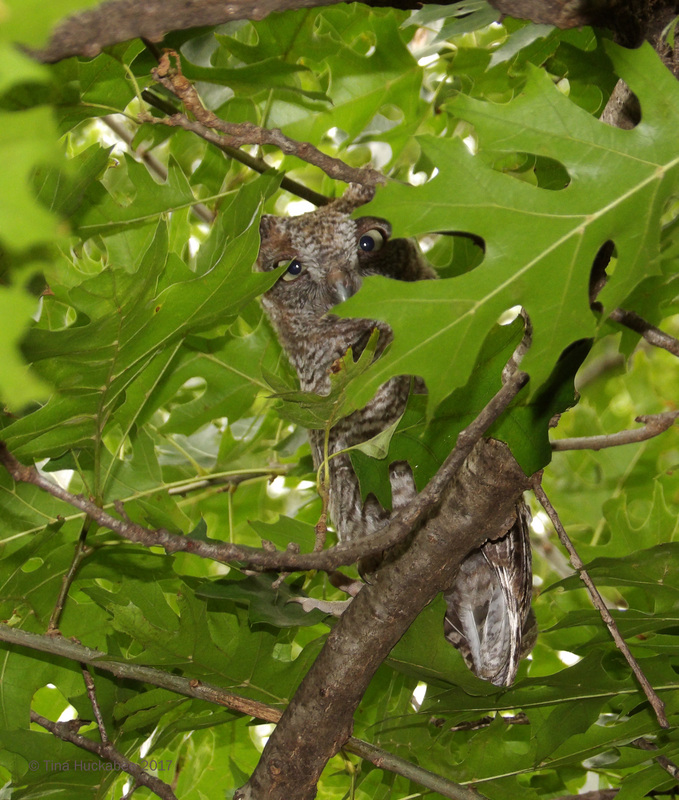 Pretty mama Eastern screech owl. Helloo! Aren’t these owlets adorable? I don’t know where she holed up and nested or where she and Dad nurtured their offspring prior to their debut in the big, wide world, but for one day, they decided that my tree was a good place to rest from the responsibilities of teaching their youngins’ how to fly and hunt during the nights. I realized before I saw the owls that the male toads in my pond–which were loudly, insistently, and nightly crooning for mates–had been silenced, and I know from experience that neighborhood owls are usually why love-sick toads are muted. 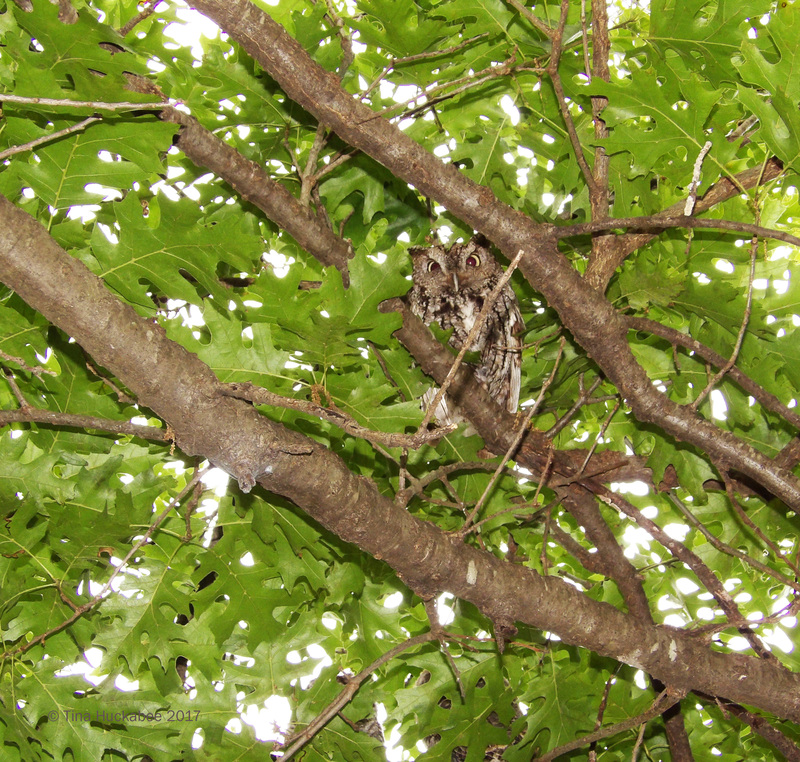 Screech owls find toads delicious and the toads choose noisy flirtation over quiet survival–every time. The evening before I spotted the owls in my tree, I heard the owlets’ chrrrrrrrr, which in owl-talk means feed me, and I spotted two adults and two owlets perched along my fence, flying to and from my tree and a neighbor’s tree. The family may have been in my tree prior to that evening, but apparently I wasn’t looking up. Even if I was looking up, the canopy of leaves works successfully to keep owls hidden from prying eyes. Foliage serves as good cover for wildlife. It was challenging to take photos, as the birds were hidden, at least partially, behind the leaves and owls certainly blend in to the trunk and limbs well. 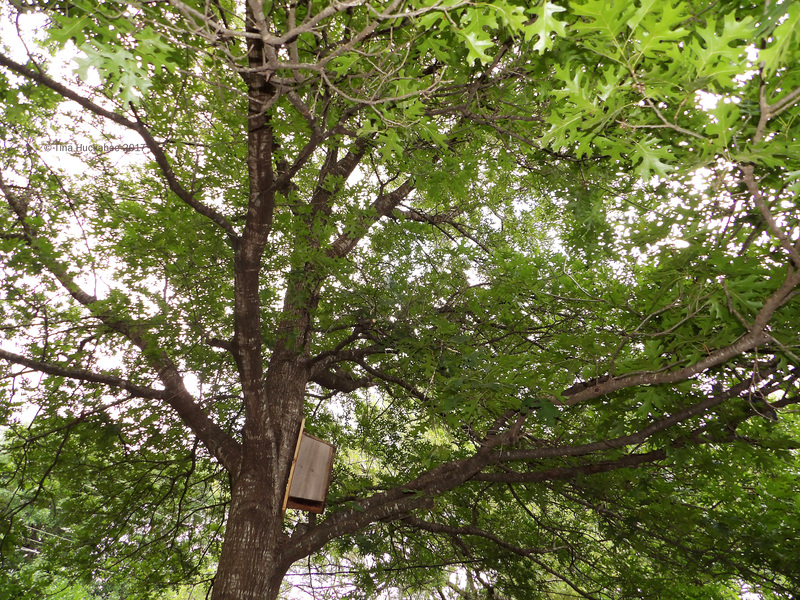 Interestingly, while Screech owls have nested in the box on this tree for years, each May once they fledge, they never perch in the tree for more than a couple of days. 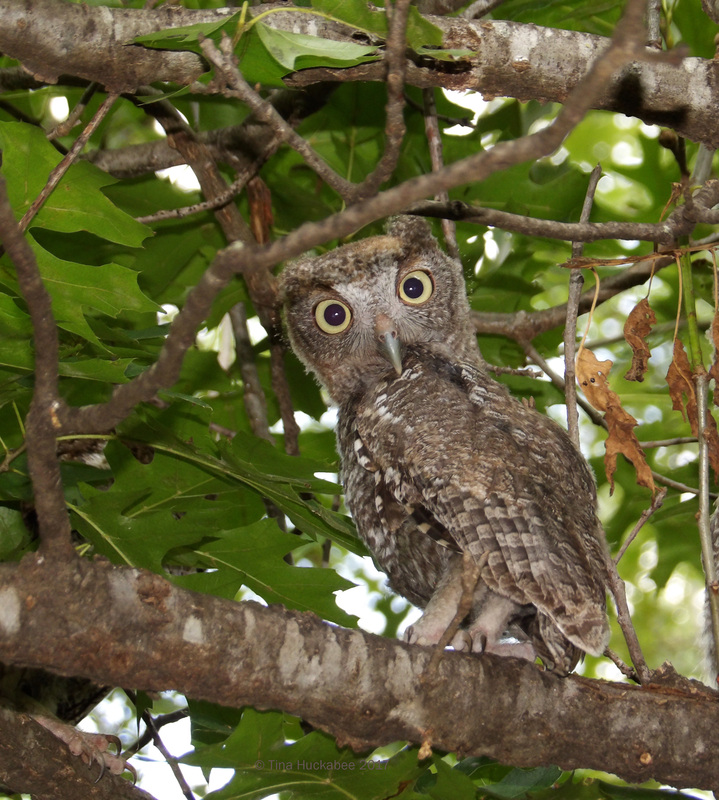 Soon after exiting their nest box for good, the owlets’ wings strengthen and carry them to other trees in other gardens, and under the tutelage of their adept parents, they learn the skills needed to survive. During the summer months, I see them occasionally and sometimes they even perch in their home tree for brief periods. I like to think they’ve come by to say hi!, but I suppose that’s wishful anthropomorphizing. Mama keeping a keen eye on the intrusive human. I’m conflicted when the oaks leaf-out in spring as it makes warbler and owl watching significantly more challenging, but that’s one of the important roles of tree and shrub foliage–providing cover for wildlife, especially for the vulnerable young ones. Foliage serves as a plant’s method of breathing, generates energy for plant health, provides oxygen for all of us, and food and sanctuary for wildlife. The owls haven’t appeared since Friday, but I’m sure I’ll see them again at some sundown, swooping from tree to tree. If I’m fortunate, I’ll spot them resting during the day, camouflaged by limbs and hidden by luscious leaves, making good use of the protection and life-giving qualities that foliage provides. Given the beauty and the importance of trees and shrubs for wildlife, why wouldn’t we appreciate foliage in our gardens? 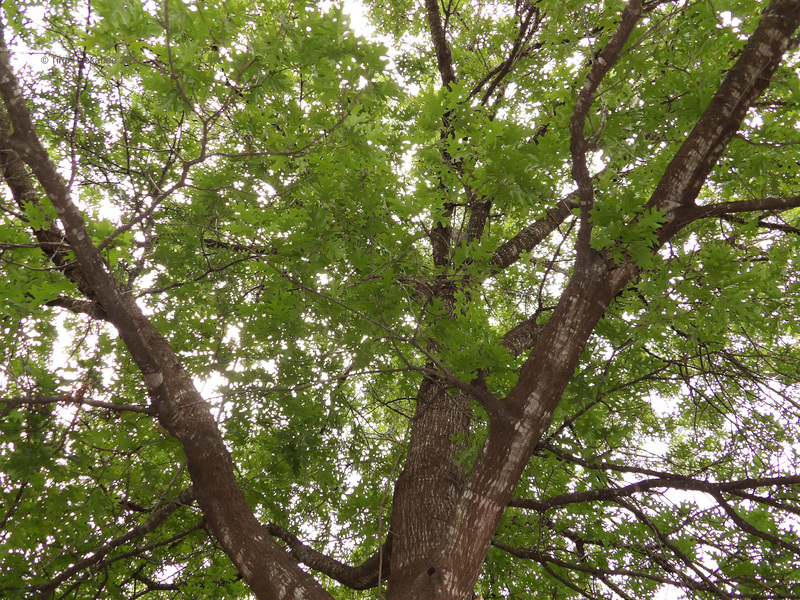 This entry was posted in Eastern Screech Owl, Megascops asio, Quercus buckleyi, Texas red oak, Uncategorized and tagged Garden Bloggers' Foliage Day, GBFD by Tina. Bookmark the permalink. Wow, such great shots! The babies eyes are so big. I had some Barred Owls, but they seemed to have moved on. The screeches will, or already have, moved on. Still, their presence is a gift. J > Wow! Leaves and owls. Eyes. Scary eyes! Haha! I don’t think of their eyes as scary, but inquisitive and intelligent. I might feel differently if I were a toad or rat, though. Wonderful photos of the Mama Owl and her owlets! We have a nice, tall Red Oak in the front yard. How far off the ground does an owl box need to be? Great shots of the owls and boy! Those eyes. 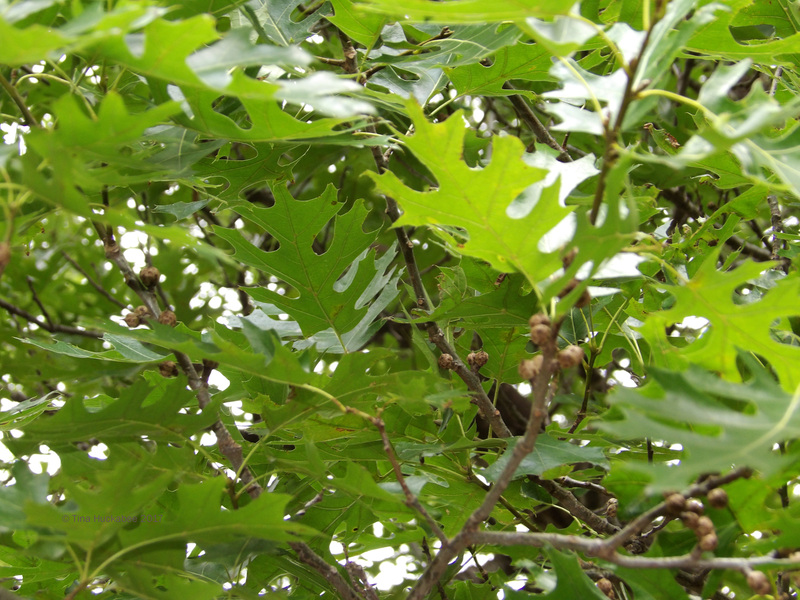 Tina its Red Oak has a beautiful and very dense foliage. The photos are wonderful. 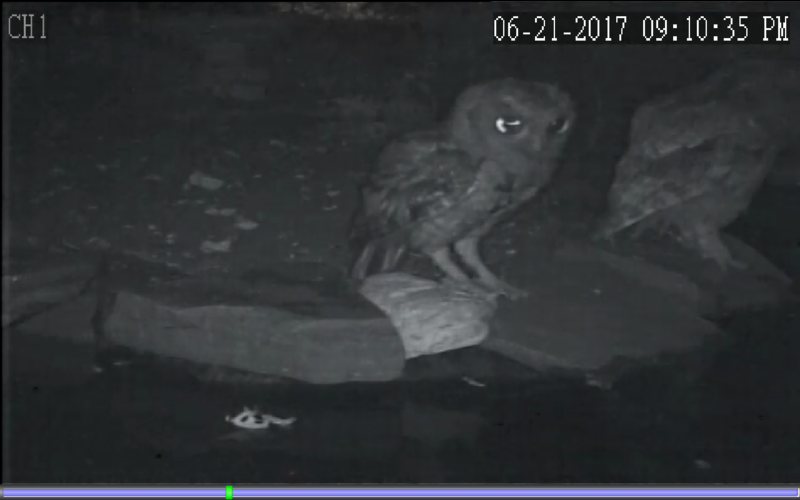 Mother Owl with her two chicks is magnificent, and that’s what her frogs ate. And the visits of the Owls are beautiful. The rescue of Owl’s chicks had to be an adventure. Luckily it had a happy ending. Have a good week. Greetings from Margarita. Thank you, Margarita. It was a thrill to have them here for a day. How did your father’s surgery go? Tina operate to my Father tomorrow May 29. Sorry for the delay in responding, but I have been very busy and I have not picked up the computer for a week. Thank you for your attention, it is very kind. Greetings from Margarita. Love your photos of the owls, those owlets are adorable! Thanks, Sue–they are the definition of cute, to be sure. My goodness. If those moved into my tree, I’m not sure I’d do anything but sit around and admire them. Your photos are wonderful, and I agree that “inquistive” is the right word. It’s great that some people have added cams to their boxes. I got caught up in watching a nest of three ospreys one year, and was lucky enough to see the last of the babies fledge from the nest. It took a long, long time for it to get up the courage, but eventually the desire to be out playing with the others overcame its hesitation. Yeah…I didn’t get much done that day. 🙂 I’m so glad it was a day that I was mostly home though or I wouldn’t have missed them. Most I the owl watching took place out my bedroom window–they were 8 feet away as the *crow* flies. I didn’t want to disturb them, though the little ones spotted me right away. Mama was about 8 inches up and covered by leaves. Wow–what an experience to observe the osprey–oh, such beautiful birds. Loved this post. Owls are such wonderful creatures! I rarely see one, but every time I do, I’m so grateful. Fabulous to hear about “your” owl family, and fabulous photos as always. I like the owl-cam idea, and hope you get a nesting family next year. Fingers crossed! Owls are wonderful! They’re so elusive, that I think we all feel privilege when we do get to observe them. Yes, fingers-crossed for next season! There is a very sweet children’s book called ‘Owl Babies’, that my kids used to insist on reading every night for I don’t know how long… Are you familiar with it? I haven’t heard of Owl Babies, though I’m certainly familiar with reading the same thing over and over and over. 🙂 I’ll check that book out! 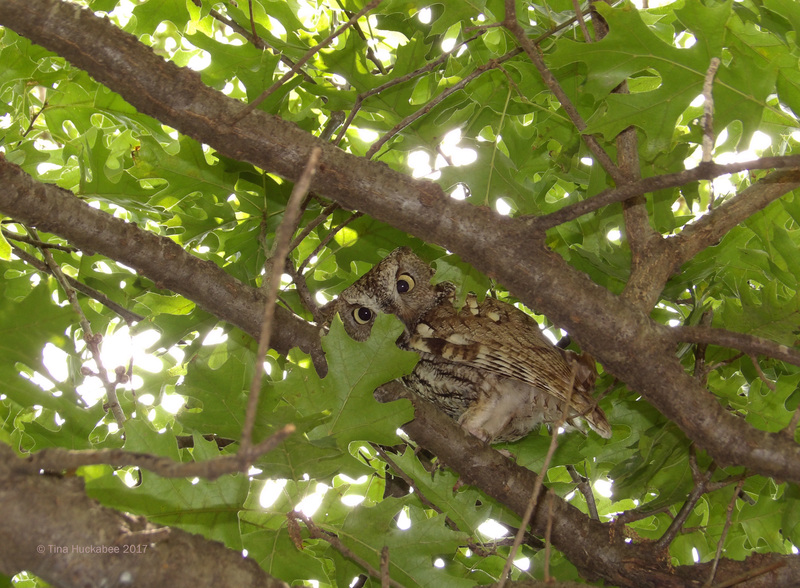 Wow, those owlets in the oak tree pics are fabulous!!! Really cute and very funny. Love your photos. Love these owls. They are quite beneficial and it’s nice to hear their call. I have been able to mimic the call and they have always answered. I love the owls, too! I haven’t seen that little family since, but there are others in our ‘hood and I’ve heard and seen them. Interesting that you can call them; I have a friend in south Austin who’s done the same thing. I guess I’d better up my game a bit! Great shots! I haven’t done that, though it’s certainly a good idea and I’m sure you’re right–we’d see lots of interesting happenings at the pond in the middle of the night!